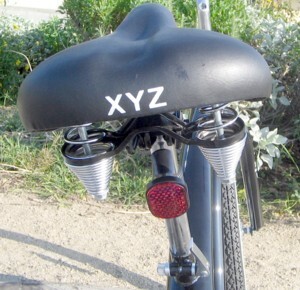 In early October I was approached by a representative for a company called XYZ BIkes, out of Hermosa Beach CA. by way of a Las Vegas Headquarters, an Internet based company selling "great looking beach cruisers for very low prices." They are a relatively new outfit. I am contacting you on behalf of my client John Vanhara with XYZBikes.com. XYZ Bikes is an internet-based manufacturer, wholesaler, distributor, designer and retailer specializing in beach cruiser bicycles. 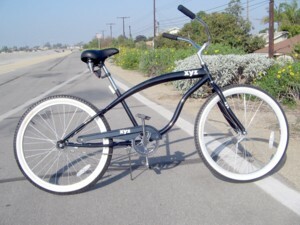 The company offers over forty beach cruiser and beach bike designs in its online catalog. In an effort to put the word out about their bikes and website, they would like to generate interest through select bicycling-oriented websites to review their beach cruisers and write a review on their website, along with a link to the XYZ Bike website. Would you be open to reviewing one of the beach cruisers (DUDE: A link was provided to a page on the website.)? If so, we would send one to you at no charge. XYZ Bikes will pay all costs to ship as well. In exchange, they are just asking that you try out the bike, write a review on your website/blog, and additionally post a link back to the website. When I first began this blog almost 5 years ago I never thought of having advertising, much less reviewing products. As blogging has evolved and as interest in my blog has grown I became an Amazon Associate, accepted Google Ads and BlogAds as well. This review marks the first time I've accepted the offer of putting a product through its paces and expressing my opinion on the item in question. They apparently think the effort on their part to be worth it (Any company that does this sort of promotion obviously is taking a big risk that the reviewer might not like the product.). We don’t intend to spend big money on advertising or other promotion. Our goal is to keep very low prices and if we have big advertising budge we couldn’t do that. We want to keep operation expenses very low and pass the savings to our customers. We don’t want to use classic retail resellers like most of our competition. Retail resellers usually add 50% mark up and customer must pay too much for their bikes. Our goal is to sell cheap directly to customers. After checking out the website and taking a few days to consider it, I accepted. I will do 2 things, here: A product review and thoughts on the company website. 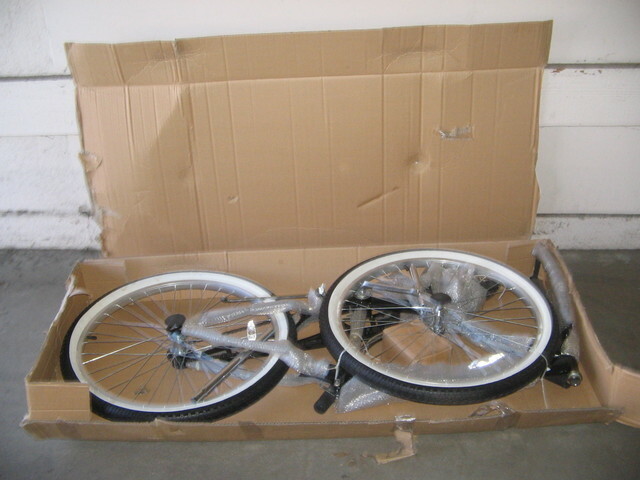 The bike came well packed in a sturdy cardboard box. This made it very easy for me, relying on Mass Transit as I often do, to transport it, out of the box, to the bike shop where, for $35, the bike was properly assembled. I wanted to test this bike not just on the Beach Trail, but on the street and Stanta Ana River Trail as a short commuter and recreation bike. For a person with limited funds who may be looking for a cheap starter bike for either of these purposes, would a Beach Cruiser be a good idea? On the 2 mile ride home from the shop I encountered an old man who stopped his car and with a big grin asked me about the bike. There is no question that riding the bike the first time was a bit awkward for this long time Hybrid rider. I had to adjust the saddle to the appropriate height for me to comfortably pedal and this made me feel a little high off the ground. The easy to use handle makes doing this a snap, just be sure to make everything is sufficiently tightened and you will be fine. You got a skinny, um, behind? No problem! Lots of room to get comfy. The low handle bars, with their wide stance, take a little getting used to, requiring you to play with their positioning a little to get them where you feel most comfortable. As you will see, in a later picture, they ARE low, espcially if you have to raise the seat a bit high for easy pedaling, but not in an uncomfortable way once you get the hang of things. You are still seated in a comfortable, upright postion. 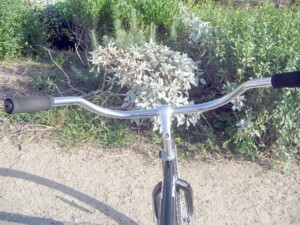 Leaning on the handle bars too hard can lead to them being lowered a little and needing to be re-positioned. 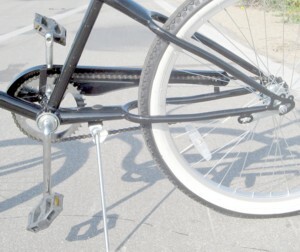 This can sometimes happen, if you are not careful, when getting on, or off, the bike, especially if the height of the saddle requires you to lean the bike over a little to get on or off. There is plenty of room to add a basket for carrying small items. The low handle bars have a nice, comfortable foam where you hold on, the pedals are nice and comfortable for the feet and the kickstand works like a charm. The above shot gives you a glimpse of the chain, and Coaster brake system. Braking requires the rider to briefly back pedal. The balloon tires are the Wanda King brand and are 26 X 2.125, inflatable to a maximum 40psi. 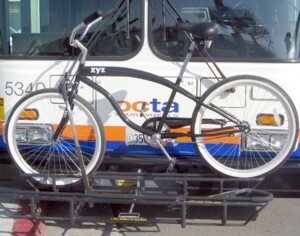 The first test ride was my 11 mile commute to work, plus a short ride on a bus to see how it got along with a bike rack. 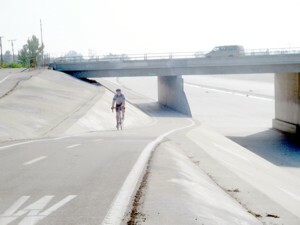 The first mile, on surface streets, included 4 corner turns and the next 3 miles were on the Santa Ana River Trail, which had a half dozen downs and ups such as the one above. You want to fly down the road at 20 -30 mph? Ok. then put some muscle into your pedaling, or ride only down hills. The bike makes what feels like wide, slow, turns, that take some getting used to, but are taken in stride with experience. Toward the end of my ride is a freeway overpass that tests ones taste for climbing on a bike like this, and ones ability to handle the brake. The bike took the hill like a trooper, not being as hard to pedal as I thought it might be. The brakes, on a flat road and on the down hill, did their job very well. That one back-pedal causes the bike to come to a gradual stop, hence the name "Coaster", though it's a bit quicker with a little more pressure applied. This is the sole reason I would not recommend the bike as a commuter to the rider not experienced in riding busy streets where the quick and reliable application of ones brakes are often needed. Want to commute, or go on short shopping forays? Choose lightly traveled routes. Even though the bike takes the cracks and bumps of the most unkept city street, like a mountain bike, it truly shines on what it was designed for: The paved Cycling Trail. You want to take a leisurely 10 to 30 mile ride on the trail of some nearby public beach, some river trail from the mountains to the sea, around a lake, in a regional park, or around a city? A path designed to be shared only by cyclists, walkers, joggers, and maybe the occasional horseback rider? This bike is a comfortable and cheap way to introduce yourself to the pleasures of this activity. It is not designed to be used as a night time ride, though a headlight can be added. I'd like to thank the guy who helped me take the above 2 pictures. You want to know how this baby performs on such trails, you are on your own. Now, for the person who, like me, relies on Mass Transit the question of the suitability of the bike for transport on a bike rack is of the utmost importance. 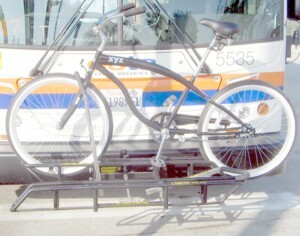 Most Bike Racks found on the front of most busses are of 2 types. Some have sloping ends on the back end. The oversized tires make the bike a little long, but the wide wheels fit snugly into place on these type racks. Some racks do not have the above slope, thus making the rack seem a little short. Even though the back tire "sits up" a little the front wheel is snugly secure, as is the bike. At least it appears that way. Not all such racks are made to accomodate all types of bikes. 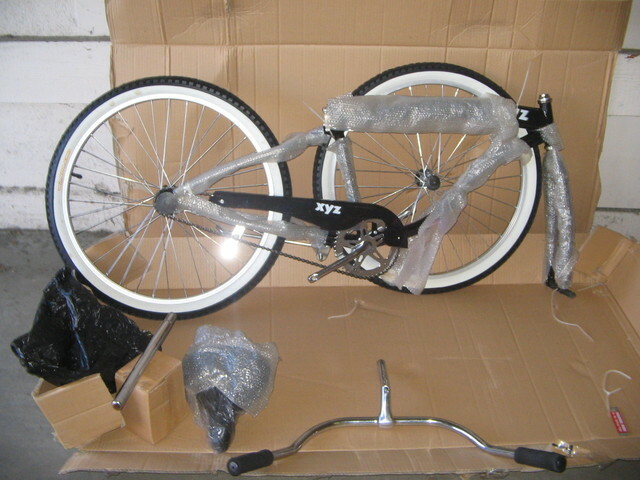 The company website sells fenders and baskets appropriate for this model bike if the buyer is interested. In short: This bike is an ideal starter ride for someone interested in sticking to paved Bicycle Trails of many different locations and varying lengths. With proper adjustments of its parts, to fit the rider, a comfortable, leisurely, ride can be a thoroughly enjoyable experience. I like it. It is easy to navigate and has enough info to help you make a purchase, not to mention ways for you to ask questions, comment, and leave your own reviews of products. The Home Page has a nice little introduction to the History of Beach Cruisers, and their place in Cycling Culture, past, and present. THE BIKE CATALOG (Store): You can log in, and create an acount, for starters. Here you can learn which items are most popular, such as the above model bike, and click on any bike, or other product that you you want to learn more about before purchasing. You can find sales and read product reviews by people who have purchased items. 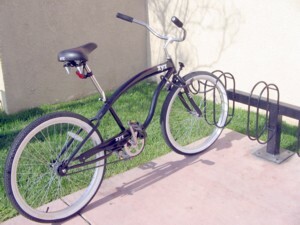 There are seperate links that take you to store pages for Classic Beach Cruisers, Women's Cruisers, Men's Cruisers and something called a Chopper Cruiser. 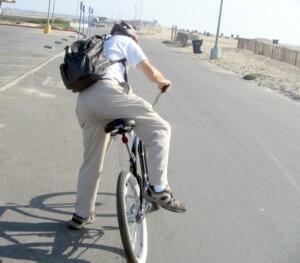 THE CONTACT PAGE: This page has info on where to by a bike in Lomita, Ca. (See Local Pick-up page for more info, and directions. ), and has an easy to fill out form for submitting inquiries to the company. THE INTERNATIONAL SHIPPING PAGE is quite helpful in that regard. THE FAQ PAGE is an informative, though evolving, section with new info being added all the time. THE BLOG: Part promotional tool, part personal observations related to products, testing, How to's, FAQS and more, it makes for fun reading, including the comments to many of the posts, and is a relatively recent addition to the site. There is an interesting section that explains the Affilliate/Reseller Program the company hopes to encourage. There is a growing Product Asembly Section, and all the info you need for Shipping and Returns. To visit the Website go here. To learn more about the specifications of the bike I have reviewed, and see more photos, go here and here. As for what plans I have for my new bike? 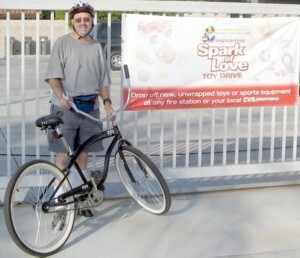 The 15th Anniversary Spark of Love Toy Drive. Liked the confidence exhibited by XYZ in having you test their bike. We carry high capacity bikes and trikes for the plus sized community. Generally they are expensive because of how strong they are built. Some models can safely transport 500 pounds. With the 40 models XYZ carries, do you happen to know if any modlel(s) have a high weight carrying capacities over 300 pounds? Do you have any suggestions for bikes that carry high weight capacities, 250 pounds plus? We would like to offer a few more on our site. You've set the bar high, C. Dude. Extremely conscientious and detailed product review. And, as you know, we'll be producing our own Mobility Transport Vehicle that will assist this market--but does XYZ have any thing in this niche? "I don't think our bikes will handle the weight, but it is good niche to focus on. Thanks for the idea and comment." The XYZ bikes are pieces of crap. 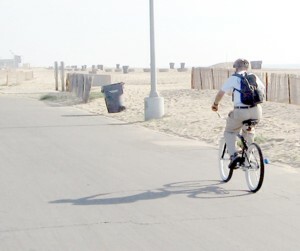 Only used it to ride down the strand at the beach, and the back sprocket already broke. Not to mention it is the squeakiest bike I have ever ridden in my life. I do not recommend these bikes. I think the style of this bike will appeal to many people. I also think they are making a wise choice with advertising and keeping cost low while making a name for themselves. Your review was outstanding and I hope to see more from this bike manufacturer. Getting back to basics is always good.